Looking for a festive but educational way to celebrate St. Patrick’s Day with your child? Well it’s your lucky day! 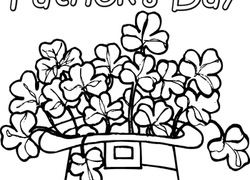 Your little leprechauns will have a grand time learning how to write limericks, completing clover-filled mazes, adding up gold coins, reading about distinguished Irish-Americans, and even creating their own leprechaun paper dolls with our engaging green-themed worksheets and activities. Follow this rainbow all the way to the end, and you'll find a lucky pot of gold! Celebrate St. Patrick's Day by playing "Over the Rainbow" a counting game with a very green theme.